According to Williams, elephants need roughly 200 square kilometers of forest to roam. When their habitats become fragmented by roads, canals, dams, and mines—as in Nepal, India, and Bangladesh—or are destroyed to create palm oil, coffee, tea, and other plantations—as in Indonesia—they cross roads and trample through fields with awesome destructive power, sometimes taking human lives in their search for food and water. Angered and frightened, the villagers, “lacking technical help and access to effective and humane mitigation methods, retaliate by throwing burning tyres, shooting at the beasts with sharpened nails, even by laying out foods laced with killer pesticides,” Williams writes. But it would be too easy to blame people for their destructive reaction to the elephants. “Imagine the psychological impact of elephant raids on villagers living in fragile mud and bamboo huts,” and the subsequent loss of a loved one, and you can begin to understand the human side of this conflict, Williams observes. To be sure, those in illegal settlements and plantations in protected parks are partly to blame for encroaching on elephant habitat with little regard for the consequences. According to an October 2007 WWF report, Gone in an Instant, Indonesia’s illegal Sumatran coffee plantations were responsible for a decline in the elephant population in the Bukit Barisan Selatan National Park (BBSNP) between 2000 and 2004. The report found that 45 “problem” elephants were killed in the BBSNP during that time as a result of human-elephant conflict. Most alarmingly, the report discovered that the conflict between illegal coffee farmers and wildlife was not limited to elephants, but that the Sumatran rhino and tiger—both listed as critically endangered by the International Union for the Conservation of Nature—were also victims of human displacement and poaching. Yet solutions to human-wildlife conflict do exist. “Sharing the Forest: Protecting Gorillas and Helping Families in Uganda,” outlines how a holistic approach—encompassing environmental conservation, family planning, basic health care, and support for alternative livelihoods—can lessen human-wildlife conflict. It is possible to reduce the rate of human-wildlife conflict—while boosting endangered species’ populations and helping communities escape poverty—but it takes creativity, patience, and a comprehensive approach. 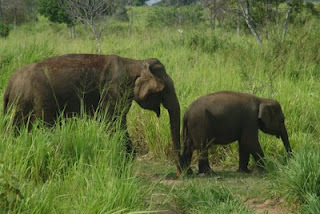 Photo: Elephants in the wild near Habarana, Sri Lanka. Across East and Southeast Asia, urban sprawl and deforestation threaten wild elephants by displacing them from their natural habitats, forcing them to compete with humans for access to vital natural resources. Courtesy of flickr user Jungle Boy.